The quad we were driving was a Bad Boy 4X4 MTV (Multi Terrain Vehicle) now available in Australia from Loaded Dog Systems. 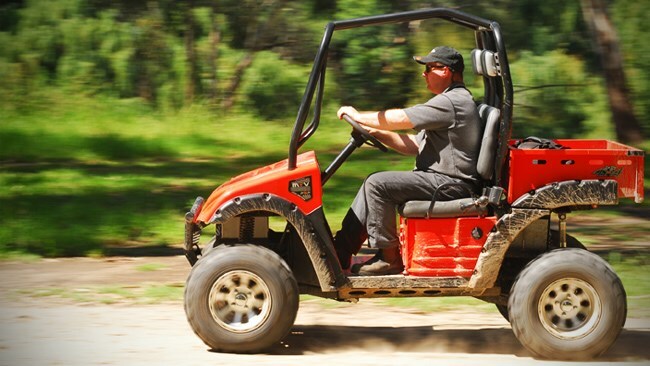 The quad we were driving was a Bad Boy 4X4 MTV (Multi Terrain Vehicle); produced by Bad Boy Mowers in the USA and now available in Australia from Loaded Dog Systems. It offers a very different driving sensation. On more than one occasion the lack of noise had me reaching for the ignition key to switch it on, only to find it was all ready to go. And once you put your foot down on the accelerator there is an instant surge, as maximum torque is available right from idle – a characteristic of electric motors that a petrol or diesel engine cannot match. I wish a normal 4X4 had that! When you want to stop, it’s more a matter of taking your foot off the accelerator than actually putting it on the brake – the regenerative braking on the electric motor pulls you up quickly enough in most circumstances. That regenerative action also helps charge the battery, so on long downhill sections you’re actually putting power back into the batteries that you used climbing the hill in the first place. The interior – well, if there is such a thing on a completely open vehicle – is pretty spartan. For the dash there’s an ‘on’ switch, a light switch, a two- to four-wheel drive switch along with a forward/reverse switch. An LED strip indicator gives you an idea of the state of charge of the six eight-volt batteries that supply all the power to the MTV. The rack and pinion steering provides a 2.3-metre turning circle, and your tyres are 22-inch all-terrain rubber. Double A-arm suspension is found on the front and articulated swing arm suspension at the back, while drum brakes are on the rear wheels, but, like we said, you rarely use them. The tilt tray can carry 180kg and, along with two people, the kerb weight of this MTV is 560kg. Top speed is 25km/h and driving range is dependant on the type of terrain you are in, but is up to around 60km. The MTV’s off-road ability was pretty darn good, too. Even in 2WD it goes most places and we only flicked the four-wheel drive switch on tougher gutters or steeper climbs. The torque of the electric motor was impressive and hauled us up quite steep slopes with ease. When we got stuck crawling over a thick log (it would have stopped a lot of bigger 4X4 vehicles) we simply got out and lifted it over. The Bad Boy MTV is well priced for such a quality piece of kit. The big plus, though, is how cheap it is to run. Fuel costs are virtually nonexistent and it’ll go from dead flat to fully charged overnight from a 240-volt outlet. There’s very little servicing or any maintenance items to look after; cleaning battery terminals, a bit of a grease or oil here and there is about it, while the high quality batteries will last for many years. This unit might not take over from mainstream petrol-powered four-wheelers, but it will make a lot of sense to quite a few people, from working farmers and agriculturalists to those wanting a working RV for the bush, whether that is for chasing pigs out on the Gulf Plains, or cruising along a beach in southern Australia, looking for a spot to cast a lure.